Find an American Heart Month Event Near You! Posted on Tuesday, February 10th, 2015 at 6:18 pm. February has a special place in our heart. (Pun intended.) We know that high-quality extra virgin olive oil has properties that can protect against heart disease and we believe that eating healthy and protecting your heart can be a delicious pursuit. Join us this month in the fight against heart disease as we team up with the American Heart Association to raise money and awareness to combat the nation’s number one killer. At each We Olive location, we are hosting fundraising events and giving away tons of great prizes like a year’s supply of EVOO, gift baskets and more! 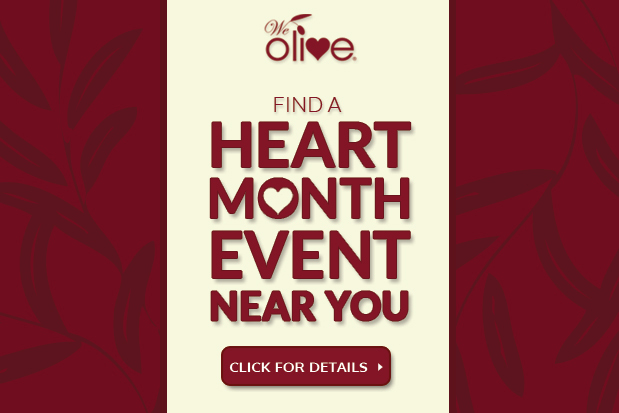 Read on to find a We Olive event near you! Events will be added as they are announced. We Olive Walnut Creek is hosting Wine After My Own Heart food and wine pairing event featuring heart healthy dishes paired with with red wines as well as a fundraising raffle with fantastic prizes. Get the details here. We Olive Folsom is hosting a heart healthy cooking demo with a delicious menu featuring Deviled Eggs with Hummus, a Chocolate Olive Oil Mousse and much more. Get more info a reservation information here. We Olive La Jolla is hosting a Happy Hearts Celebration Party! Details can be found on their events page. Stop by We Olive Ventura between noon and 3pm today for heart healthy appetizers and mocktails and donate and enter to win a fabulous gift basket! We Olive Paso Robles is hosting a fundraiser featuring delicious food and wine with lots of raffle prizes. Get the details here.